7 1/2 by 13 7/8 in. At all hours, in all seasons, Fontainebleau always offers impressions that penetrate the human soul and excite a lively poetry. “In nature, he [Rousseau] discovers thousands of completely new things. The repertoire of his sensations is immense. Every season, every hour of day, evening, and dawn, all the inclemencies of weather, from the hoarfrost to the dog days; every altitude, from the strand to the hills, from the downs to Mont Blanc; the villages, meadows, copses, forests, the naked earth, and the foliage with which it is covered-there is nothing that has not tempted him, stopped him, won him over by its interest, persuaded him to paint it.” (Eugène Fromentin, Les maitres d’autrefois, Paris, 1876, p. 277). The Barbizon region in particular seems to have exerted a pull on Rousseau. 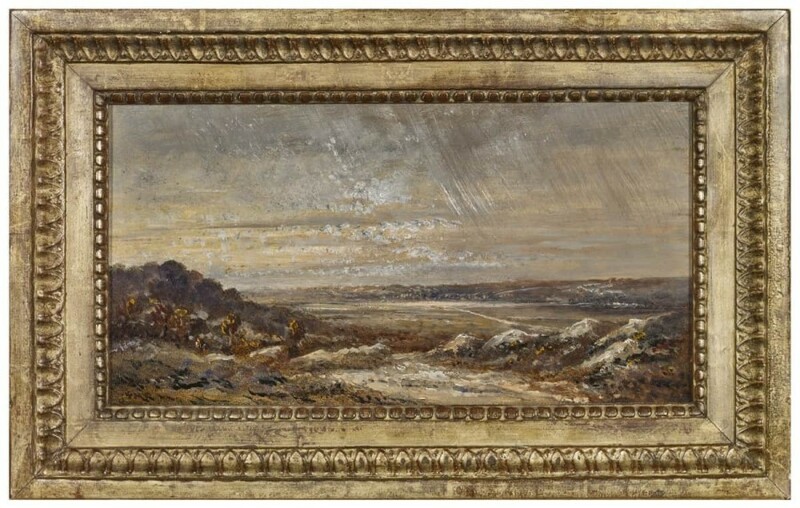 It may have started with a brief stop-over to paint in the Forest of Fontainebleau in the 1820s. This region, with its vast terrain of dark forest interiors and sunlit clearings, coupled with dramatic rocky plateaus and gorges provided a virtually endless source of inspiration for the landscape painter. Nearly twenty years after his initial acquaintance Rousseau returned yet again, this time to make his home in the nearby village of Barbizon. The time he spent in the region allowed him the familiarity to perceive and be inspired to record the subtleties of light at different times of day and varied atmospheric conditions. Rousseau had apparently found his muse - he remained there until his death in 1867 often composing plein-air studies of which the present picture is an example. This view of the Gorges d’Apremont was executed in Barbizon in 1858. It shows the gorge in the volatile conditions of an approaching storm. 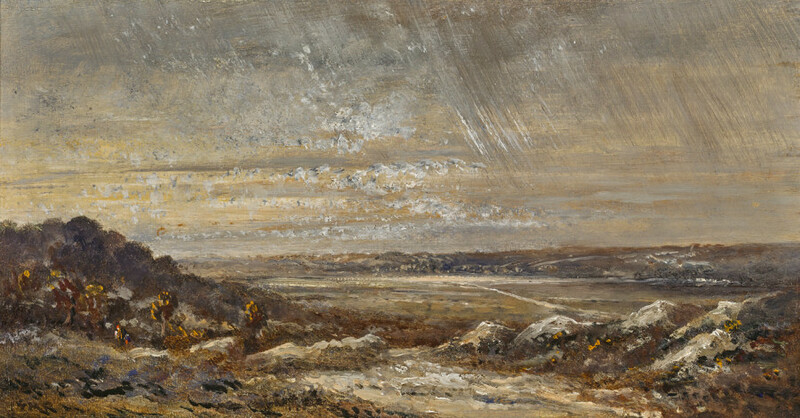 The panoramic point of view of this quickly moving weather system allows the artist to depict the varying conditions that occur in rapid sequence, simultaneously. Thus we witness the wind and gathering clouds, the rain, and the distant promise of bright sunshine. To create a convincing downpour, Rousseau has applied quick diagonal lines of paint set against quick dabs of colored pigments for the clouds and landscape. The overall effect is dramatic turbulence and movement and a broad palette of color. 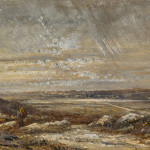 Rousseau was not the only artist to paint a rain storm. 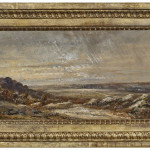 The theme had also been the subject of both John Constable and Gustave Courbet, two artists, who like Rousseau, had also been inspired to paint the enormous energy and drama of nature’s ever-changing landscape.